How can I hand-sew an "invisible" hem? I'm sitting at work and my pant cuff started unraveling. Luckily I have a needle and thread in my purse, and I would like to repair this while I'm on a conference call with little else to do. Since these are work pants, I don't want to see the hem after the repair is done. What sort of stitch am I trying to do, and is it something I can do by hand (at least sturdily enough to get through the day)? Yes, what you need is called a blind stitch to create a blind hem… and it can definitely be sewn by hand. Of course, hemming pants while you are wearing them is a bit more difficult, and it will never look quite as finished without an iron. But in an emergency, this will work great and the stitches will remain virtually unseen. Start by folding your cuff under to the correct length (wrong-side to wrong-side) and crease the fold as best you can with your fingers. Now grab the entire cuff (two layers of fabric) and fold the hem back to the right side so it leaves just a little bit of overhang (~1/4" or so). Now sew along your hemline through the three layers so the stitches will catch only a very small piece on each side of the fold. Run the stitches around the entire circumference of the cuff. When you turn the hem right-side out, you will have a virtually invisible seam. For an emergency quick tack, you probably wont need so many stitches. The tighter stitches assure you won't catch a toe and rip the stitches out when you put the pants on, but in the situation you are describing, one stitch every inch or so (or even every few inches) should be enough to get you through the day. The basic idea is always to have ideally all visible stitches at the back of the fabric. Common denominator is that in all single-layer parts of the seam only a few threads of the fabric are picked up or a short length of fabric is visible. For a single fold, the hem stich (German term "Hexenstich", will research the English term) that stitches against the general sewing direction works best, especially for a fast fix. Fix your thread on the left side of the un-unraveled seam (fold pointing towards you). Make a small stitch from right to left (="backwards") 1/4 to 1/2 inch diagonally to the right over the starting point. Place the next backwards stitch diagonally down in the seam fabric. Pull the thread tight, but not so tight that the fabric puckers or creates waves. 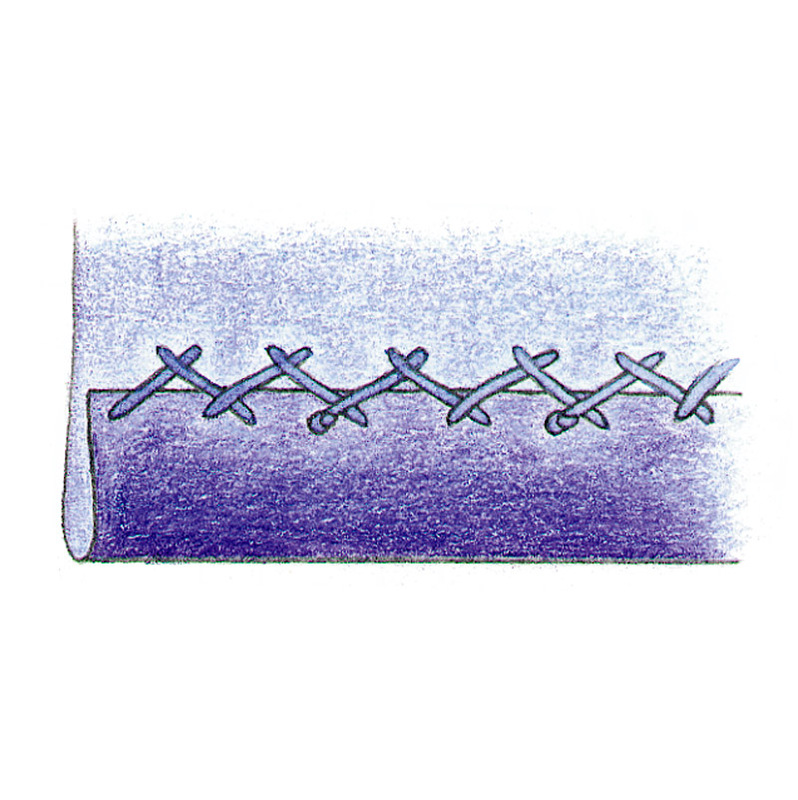 Every few stitches, secure the thread with a backstitch or two in the seam fabric. Finish as usual at the end of the unravelled piece, taking care to do the stitching only on the folded part of the fabric to remain invisible. With a reasonably matching thread, you should get an invisible seam in quite short time.